The first school building in Iowa Park was erected in 1888, soon after the town was platted. Iowa Park was in Wichita County Rural District No. 7 until it became an independent school district in 1899. The school grew to four rooms but soon was inadequate for the growing student population. New brick structures were erected in 1901 and 1916. Superintendent W. R. Bradford sought accreditation for the district and achieved this goal in 1921. At that time there were 11 teachers and 495 students; the the 1925-1926 school year there were 25 teachers and 595 students. The new W. F. George High School, built in 1924, had 13 classrooms, a laboratory, office, library and an 800-seat auditorium. The 1916 structure became the Ward School for Elementary Students. Works Progress Administration funds made possible the erection of a new elementary school with a cafeteria in 1940. 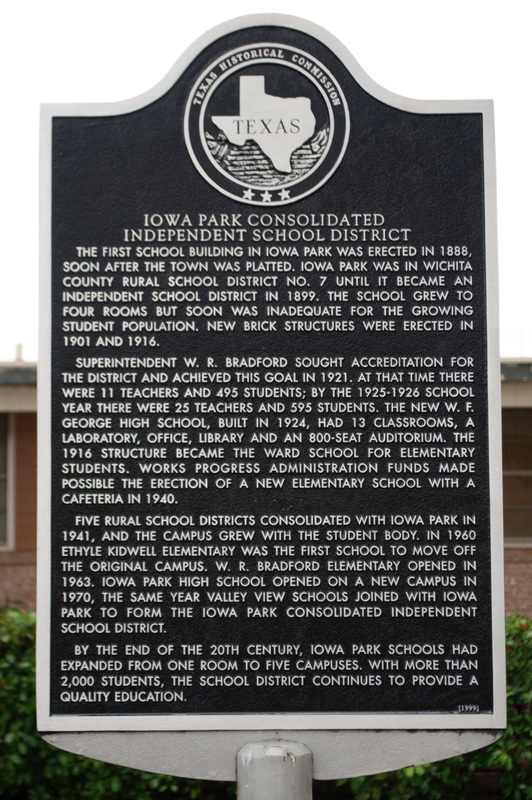 Five rural school districts consolidated with Iowa Park in 1941, and the campus grew with the student body. In 1960 Ethyle Kidwell Elementary was the first school to move off the original campus. W. R. Bradford Elementary opened in 1963. Iowa Park High School opened on a new campus in 1970, the same year Valley View schools joined with Iowa Park to form the Iowa Park Consolidated Independent School District. Located at 413 East Cash, Iowa Park Texas 76367. GPS coordinates: 33-degrees 57' 5.7" -98-degrees 39' 48.0".